Simpler specification for housebuilders as Aggregate Industries streamlines NHBC-compliant toppings. Aggregate Industries’ concrete division has announced it is making it easier for housebuilders to specify compliant structural topping products, by unveiling a consolidated range of reinforcement solutions suitable for any beam and block flooring system. The introduction of the range follows the implementation of the National House Building Council’s (NHBC) Technical Note 20 guidelines in January this year. 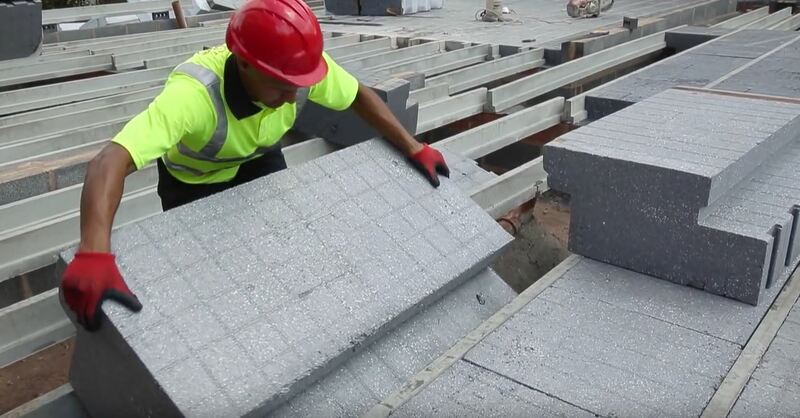 The standard defined technical considerations around installing a beam and block flooring system; particularly that the use of micro fibres, as an alternative to steel mesh reinforcement, is now no longer acceptable to the NHBC. Instead, structural toppings requiring approval by the NHBC must use one of the following reinforcement options; macro ‘structural’ synthetic fibres, steel fibres or steel mesh reinforcement. Aggregate Industries’ range of NHBC-compliant structural topping products includes: Agilia H (Housing) – a self-compacting structural topping containing 4kg of polypropylene macro ‘structural’ fibres; Highpave (Housing) – a concrete available in a range of consistencies and strengths containing macro structural fibre reinforcement with 4kg of polypropylene macro fibres and Agilia H – a self-compacting structural topping option that can be used in conjunction with steel mesh reinforcement. Neil Cochrane, Specification Manager at Aggregate Industries, explained: “Beam and block floors remain the most popular solution for housebuilders when building a ground floor; however the introduction of the latest NHBC guidelines have changed the parameters of what is deemed an acceptable reinforcement solution. The introduction of the NHBC-compliant concrete structural toppings range forms part of Aggregate Industries’ complete structural flooring system offer, which includes a bespoke beam and block solution from Charcon Construction Solutions.